The Brisbane-based boxer claims he was hard done by last night. 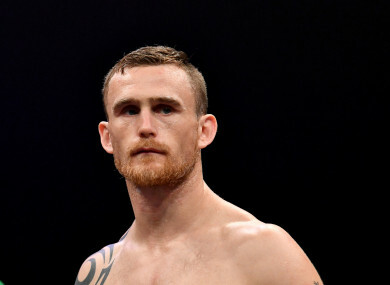 KILDARE BOXER DENNIS Hogan was left disappointed on Saturday night, losing a WBO World light-middleweight title fight in Monterrey against Jaime Munguia. The 22-year-old Mexican boxer was deemed the victor, with the judges awarding scores of 115-113, 116-112 and 114-114, and Munguia prevailing on a majority decision. But Munguia may consider himself fortunate, with many independent observers feeling Hogan was hard done by. Mounting the fourth defence of his strap, Munguia (33-0) struggled to assert himself against Hogan’s nimble footwork during the opening five rounds, before finally bringing his trademark body blows to bear against the 34-year-old Irishman. “I knew I won the fight,” Hogan said afterwards. “I knew in my heart and soul. I’m so disappointed to train as hard as I did and for this to happen. “We came here in good faith and it’s no disrespect to anybody here, but apart from the people who scored it and allowed this decision to go through, everybody knows. Munguia, meanwhile, claimed he had rightfully been awarded victory, while offering Hogan a rematch. Email “'I won the fight' - Controversy as Kildare's Hogan loses world title bout”. Feedback on “'I won the fight' - Controversy as Kildare's Hogan loses world title bout”.